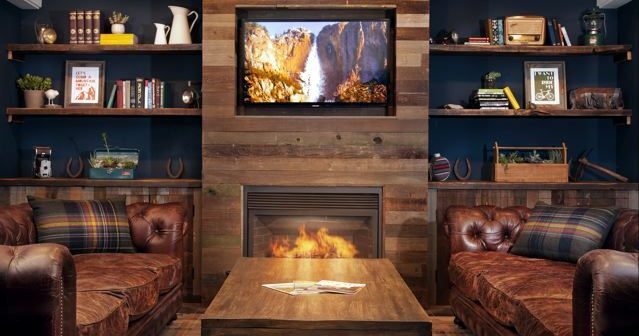 Snuggle into a sofa by the fireplace at Basecamp Hotel at Tahoe City. 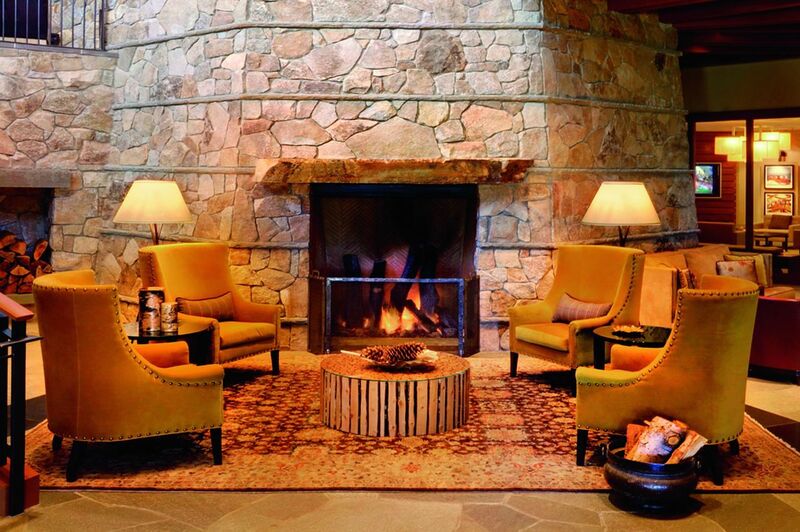 When the weather outside is frightful at Lake Tahoe, skiers and snow bunnies head for the fireplaces and the fire pits, the hot springs and all those other tootsie-toasting spots around the lake. 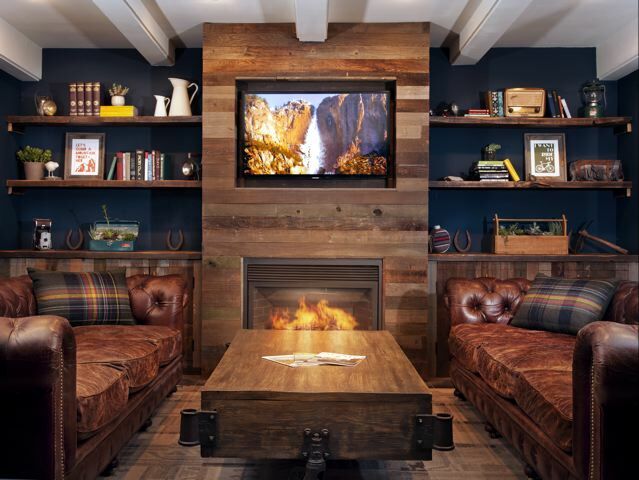 Even if you can’t imagine plunging down an icy slope in the freezing cold, don’t hesitate to plan a winter weekend at Tahoe, where you can while away a frosty day or two with a book, a few hot toddies and your feet up by a roaring fire. As the sun sets over the largest alpine lake in North America, there is no better place to catch the waning rays than at the Lone Eagle Grille at the Hyatt Regency Lake Tahoe Resort in Incline Village on the North Shore. Around a crackling lakeside fire pit, chilly fingers warm up on mugs of hot buttered rum; and if you have to wait for a table in the restaurant, grab one of the armchairs by the big stone fireplace. In the Hyatt’s spa, a flickering fire warms the lounge, and one of the couples’ “sanctuaries” also has a fire feature. To make it irresistibly comfy and easy for skiers, hotel guests can purchase lift tickets in the hotel lobby, then hop on the free shuttles to Diamond Peak and Northstar ski mountains. Tahoe is legendary for its apres-ski scene, from “Next Gen” brew pubs to Vegas-style nightspots where snow bunnies shake their booties, and family-friendly fire pits with s’mores and hot toddies. leather sofas by the double-sided fireplace and send the kids out to the deck where they can sip hot chocolate and roast s’mores around the fire. And, a few minutes south of here around the lake, Westside Café and Inn is famous for its complimentary late afternoon “Après S’mores,” served weekends and holidays on the waterfront patio fire pits. You can cross-country ski down the road at Sugar Pine Point State Park, downhill ski right across the street at Homewood Mountain Resort, or just settle in by the fire in the lantern-lighted, leather-and-stone lobby with your Kindle and your Irish coffee. Nearby, since the 1950s, Sunnyside Restaurant and Lodge, has been wildly popular in the summertime when classic boats tie up at the 1,000-foot-long pier below the deck where gangs of vacationers scarf up french-fried zucchini and Mango Mai Tais. When the snow flies, an armchair is the big attraction by the giant boulder-framed fireplace in the newly refurbished bar and grill. And if you can’t bear to brave the blizzard after dinner, head up to one of the lakeview lodge rooms with wood-burning fireplaces. Inland a few minutes, anchoring Squaw Valley–Alpine Meadows ski mecca, the Resort at Squaw Creek overlooks the entire valley and snowy peaks topping out at 9,000+ feet. A hot chocolate and s’mores bar, and blazing space heaters, are lined up all winter at the fire pit outside of Sandy’s Pub by a photogenic, frozen waterfall. You can earn your s’mores here by skating on the (guests only) ice rink; and by cross-country skiing, sledding or snowshoeing in the meadows, right from the on-site Nordic Center. Then hunker down with a toddy in front of the massive lobby fireplace. In Squaw Valley Village, shoppers and diners cozy up to outdoor fires and live music entertains on weekends, while enclosed tram cars whisk skiers and sightseers up to High Camp at 8,200 feet to ski, ice skate, explore the Winter Olympic museum or just to gape at the panoramic views of Sierra Nevada peaks and the gleaming lake. 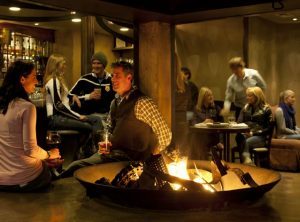 In the village, a busy gathering spot at Plumpjack Squaw Valley Inn is the indoor, open fire feature in the bar –– yes, indoors. And, another reason to come here is the S’more Cheesecake, topped with caramelized, homemade marshmallows. Just west of the lake, Northstar California Resort ski mountain also welcomes nonskiers to enjoy breathtaking gondola rides to the new Zephyr Lodge on the upper mountain, where lunch by the two-story-tall windows comes with glorious views of the snowbound setting. In the main shopping, dining and entertainment village at Northstar, a 9,000-square-foot ice skating rink (free to all) is surrounded by several blazing fire pits, where you can order libations and snacks. 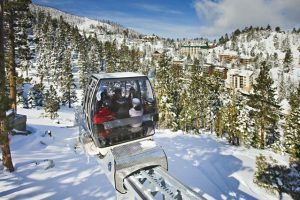 High above Northstar, accessed either by car or by the “Big Easy” chairlift, the Ritz-Carlton Lake Tahoe pampers hotel guests at the whopping-big fire pit with an Après-Ski Champagne Experience, with raw bar and the nightly “Marshmology” demo of how to make s’mores. Kids are into the hot chocolate bar and games in the club room, while moms and dads snuggle by their in-room fireplaces or on sofas by the towering stone fireplace in the lobby bar. And go ahead and take a dip in the heated pool––the deck is heated, too, to keep your toes warm. Aaah, in the slopeside spa at the Ritz, a cozy fire heats the restoration lounge, while the sauna and eucalyptus steam room restore tuckered skiers. Far from the maddening crowds of snowboarders, seekers of warmth and comfort head east of South Lake Tahoe to historic natural hot springs. For travelers heading back to the Bay Area on Highway 50, a stop at one of these resorts makes for a restorative ending to a Tahoe getaway. Once a stop on the Pony Express route out in the Carson Valley near the town of Genoa, David Walley’s 1862 Hot Springs Resort is an inviting compound of five hot springfed pools, an outdoor heated pool, a steam room and dry saunas; and also, an 1862-themed restaurant and saloon. Since 1848, bathers have soaked their aches away at Carson Hot Springs Resort near Carson City. Public outdoor pools and indoor private pools are filled with hot, mineral-rich water from 35,000 below. A short drive from the south side of the lake through the gorgeous Hope Valley and the Carson River canyon, Grover Hot Springs State Park can be found in an alpine meadow and pine forest at 5,900 feet surrounded by 10,000-foot-tall peaks. This is an affordable favorite where 148-degree natural hot mineral water is cooled to 104 before feeding into the main pool, and there is also a cool pool for that final plunge. World-famous for glitzy casinos, the neon-lit city of South Lake Tahoe is home to the sprawling Ski Heavenly, which is accessed from smack in the middle of downtown. A must-do for first-timers is a heart-stopping 2.4-mile glide on the Heavenly Mountain Gondola up to the observation deck at 10,000+ feet, for birds-eye views of Lake Tahoe on one side and the dark forest of Desolation Wilderness and Nevada’s vast Carson Valley on the other. Back on terra firma, across the street from Heavenly Village, Ten Crows eatery at the just-opened Hotel Becket has an outdoor bar with fire features, complete with a hot chocolate bar and the makings for s’mores. Accommodations are either minimalist or updated rustic, with old barn doors and furnishings crafted of reclaimed Douglas fir from a Nevada mine shaft (prettier than it sounds). The resident Bernese Mountain dog, Remington, loves to take guests on walks in the snow. On the south end of town, Fireside Lodge B&B has an enormous tree trunk atop the colossal fireplace in the Old-Tahoe-style, knotty pine-paneled, memorabilia-cluttered Gathering Room. Guests who can tear themselves away from the river rock fireplaces in their family suites can enjoy complimentary wine and cheese while their kids enjoy the game room and toasting marshmallows on the deck. On Ski Run Boulevard for nearly 40 years, Nepheles restaurant is a locals’ favorite for the cuisine and the three private outdoor soaking tubs, which can be reserved by the hour until 2 a.m. Order a cocktail, slip into bubbly hot water and relax until you’re ready for dinner at a candlelit table. High above downtown, the Ridge Tahoe Resort is a quiet aerie with zowie views from the rooftop hot tub and from just about everywhere on the property, from the indoor and outdoor swimming pools, from the balcony of your condo and the Skier Express chairlift that zips guests right to Heavenly ski slopes, and from the Bear Trap Lounge, where happy hour revelers are warmed by the fire. Hotel Becket, 4003 Lake Tahoe Blvd., South Lake Tahoe, 800 738-7477. The newest of Joie de Vivre boutique hotels, across the street from Heavenly Village, indoor/outdoor bar with fire pits, private beach access; 167 sleek, contempo-style or woodsy-style guest rooms. Resort at Squaw Creek, 400 Squaw Creek Road, Olympic Valley, 800 327-3353. 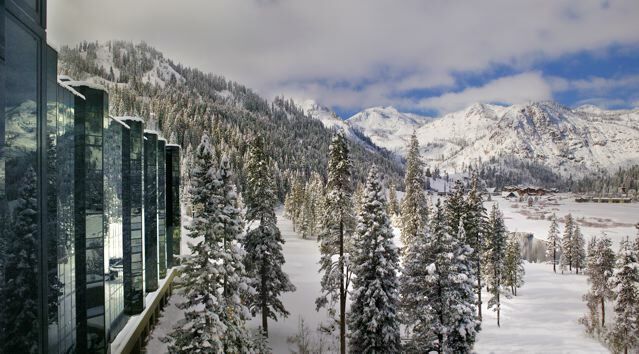 Luxury accommodations in a high rise above Squaw Valley. Deluxe rooms and fireplace suites with kitchens. Ski-in-ski-out access, on-site Nordic skiing and sledding; ice rink, golf course. The Coachman Hotel, 4100 Pine Blvd., South Lake Tahoe, 530 545-6460. Opened in 2016, 42 affordable lodge rooms with a contempo glamping vibe; walk to the Heavenly gondola and casinos. Gar Woods Grill and Pier, 5000 North Lake Blvd., Carnelian Bay, 530 546-3366. Indoors or on the glassed-in deck, just the spot for a long lunch, Sunday brunch, or sunset dinner while watching boating activity on the lake. Happy hour by the fireplace in the bar and grill. River Ranch Lodge, 2285 River Road, Tahoe City, 530 583-4264. In an historic lodge, a very popular indoor/outdoor restaurant and bar, within view of the Truckee River; rafting trips end here. Comfort food by the fireplace; cozy guest rooms upstairs. Red Hut Café, 2723 and 3660 Lake Tahoe Blvd., South Lake Tahoe, 530 541-9024. Since 1959, with retro red-vinyl stools and booths, famous for huge waffles, biscuits and gravy, homemade soup, grilled cheese, burgers and more comfort food for breakfast and lunch. What is your favorite spot at Lake Tahoe? Been there in summer and in winter?